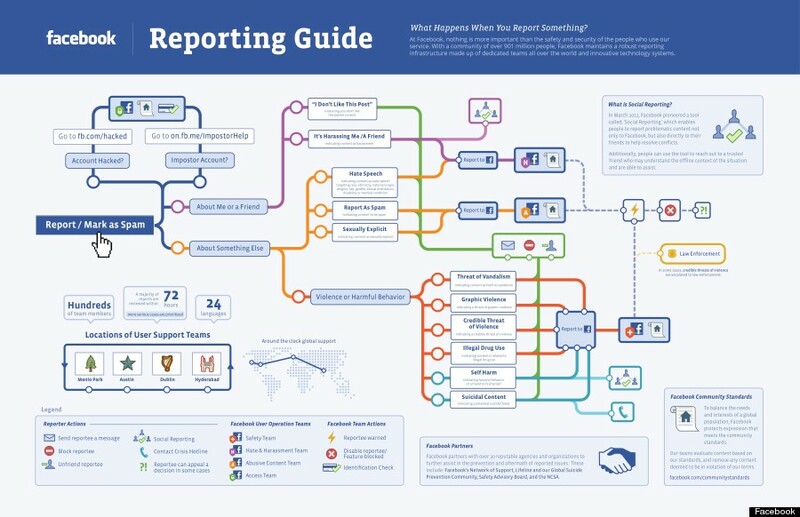 Posted on June 20, 2012 March 3, 2015 by Sarah R.
As reported by Reuters and picked up in the Huffington Post, Facebook today released a confusing infographic ostensibly designed to shed light on the cryptic route that reported content takes through the company’s circuit of screening. Facebook released this circuitous infographic allowing users to follow the path of content flagged as inappropriate through the channels of its review process. According to the company, content flagged as inappropriate, for any one of myriad reasons, makes its way to “…staffers in several offices around the world to handle the millions of user reports it receives every week about everything from spam to threats of violence.” Reasons cited in the infographic that may cause material to be reported include content that is sexually explicit, involves harm to self or others, depicts graphic violence, contains hate speech, and so on. What the infographic and accompanying statement from Facebook fail to do is to suggest what amount of content is routed through this circuit, and how much of a problem addressing problematic user-generated content (UGC) routinely tends to be. In reviewing the infographic, the lack of real information it provided about workers, the nature of this issue and the nature of the content being flagged left me thinking of the old disparaging computing phrase of “security through obscurity;” the infographic offers protection to Facebook by revealing very little of import. It is obscurity through ostensible transparency. Critically lacking, for example, is a lack of discussion of the working conditions for the “staffers…around the world” who contend with this material as a major function of their job. Are these staffers full-time Facebook employees, afforded the status and benefits commensurate with their positions? As other reporting has already indicated, and as I have discussed in another entry on this site, Facebook indeed employs micro-work sites such as oDesk and others to conduct these moderation and review practices. The workers engaged in the digital piecework as offered on micro-work sites are afforded no protections or benefits whatsoever, and do not even benefit from the ability to commiserate with other workers about the content they view as a condition of their work. In this way, Facebook benefits from the lack of accountability that comes with introducing secondary and tertiary contracting firms into the cycle of production – a fact that is critically absent from the infographic above. Workers engaged as moderators through digital piecework sites are isolated, with few (if any) options for connecting – for emotional support as well as for labor organizing – with other workers in similar conditions, and without any real connection to the worksites of origin from which the content emanates. While the micro-work sites and the major corporations that engage them may tout the ability to draw on expertise from a global labor marketplace, in practice even the New York Times notes that these temporary work relationships result in lost payroll tax revenue for companies such as the US when labor is outsourced, and note that increases in these kinds of labor pools are significant in Greece and Spain, countries devastated by economic crisis and crippling “austerity” measures. Notably absent, however, from the NYT piece is any discussion of the bargain-basement rates that drive the value of the labor down to the lowest bidder, by design. The connection between economic crisis in a region and an increase in the availability competent labor that is exceedingly cheap cannot be lost here. Of course, one cannot reasonably expect Facebook or any other company to ease the way for workers to organize and push back against unpleasant work conditions and unfair labor arrangements; this, after all, is one of the features of outsourcing and using intermediaries to supply the labor pool in the first place, along with the lack of regulation and oversight that these arrangements also offer. In response, non-traditional organization among workers in these sectors is taking place, such as in India, where UNITES Professionals have issued a charter for IT and call center workers, and the Precarious Workers’ Brigade, whose focus is educational and cultural workers, but whose model and scope could certainly conceivably be extended to workers engaged in screening and moderation. I really enjoyed reading this post and I’m going to share it with my students. What is important about your last point, in particular, are the ways that sweat shops vis-a-vis call centers and other IT workplaces are part of the landscape of American business that prioritize moving jobs off-shore rather than creating jobs for the U.S. labor force. I find your post compelling right now given that Facebook’s founders are in the headlines for renouncing citizenship, and doing anything they can to avoid putting resources into the U.S. economy by not paying their fair share of taxes. Furthermore, their business model is predicated upon data mining of their users’ labor for profit (selling our clicks and interests to advertisers — much like Google — the subject of my research. I call this the phenomenon of “labortainment”), using our public roads, mail system and airports to conduct their business (funded by taxes) coupled with hiring the cheapest possible labor to do the most heinous and harmful parts of the content screening. Throw in that it’s all outsourced to people of color abroad. This is just abysmal. Why can’t we all move to Diaspora, Pathbrite, or some other platform that allows us to sleep at night. I need a “don’t like” button. As always, thanks for your thoughtful comments, Safiya. Your feedback always ties what I’m talking about it other phenomena worthy of our attention. I really appreciate it! Thanks for the visit, Cherie, and I’m glad you found this of interest! It is disturbing, to say the least. Hope to have more information to share with you soon about content moderation.